The British Library has announced that: "Something magical is happening to mark the twentieth anniversary of the publication of Harry Potter and the Philosopher’s Stone…"
A new exhibition about the magic of Harry Potter is set to open at the British Library in autumn 2017, marking the twentieth anniversary of the publication of Harry Potter and the Philosopher’s Stone. The exhibition will open on 20 October 2017 and run until 28 February 2018. From medieval descriptions of dragons and griffins, to the origins of the philosopher’s stone, the exhibition aims to take readers on a journey to the heart of the Harry Potter stories. 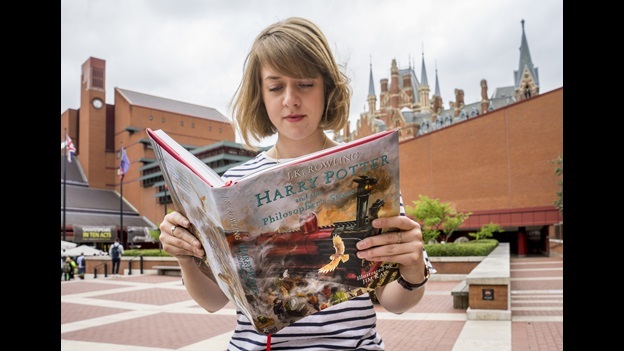 The exhibition will showcase an extraordinary range of wizarding books, manuscripts and objects, and combine centuries-old British Library treasures with original material from Bloomsbury’s and J.K. Rowling’s archives. The first book in the series of Harry Potter novels, Harry Potter and the Philosopher’s Stone, was originally published by Bloomsbury in 1997. Since then Bloomsbury has published all seven of the Harry Potter novels in children’s and adult editions, three charity books – Fantastic Beasts and Where to Find Them, Quidditch Through the Ages and The Tales of Beedle the Bard, and the Illustrated Edition of Harry Potter and the Philosopher’s Stone. More information about the exhibition will be released early in 2017, and tickets will be on sale from spring 2017 at www.bl.uk.